It is called Pineberry because of it's unique flavour - it has a distinct after-taste of pineapple! With a unique creamy white look, and red seeds - the exact opposite of conventional strawberries. Very intense flavoured fruit, smaller than normal strawberries, but really flavour packed. This brand-new, improved variety is much larger than the traditional white alpine strawberries, and packed full of the distinctive, delicious tropical flavour! Although they have occurred naturally in the wild for some time, as Alpine strawberries, there has not been a larger White Strawberry on the market until now. Called Pineberry due to it's unique flavour - much more intense than normal strawberries it has a distinct after-taste of pineapple! This makes it a most interesting addition to fruit salads, but also it tastes superb complimenting ham salads, and savoury dishes too. 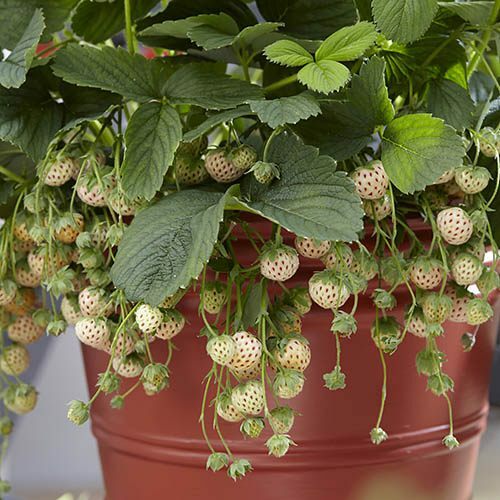 Treat Pineberries exactly as you would conventional strawberries plant them from January to May for summer crops in the same year, or in autumn for early crops the next season. Grow some super-sweet tasty fruit on your patio this year. Supplied as kit of 4 x 6cm diameter jumbo plugs of Pineberry, plus 2 runners of Strawberry Sonata as a pollinator, which should be grown in close proximity.